What is a garden structure? That can be a difficult question to answer. The term “garden structure” is, after all, a catch-all that covers a wide variety of objects and things. Even then, defining objects as garden structures can be difficult. A garden structure can be a fountain, although not all fountains are garden structures. A garden structure can be a statue, although not all statues are garden structures. So what makes a garden structure count as a garden structure? The only requirement is that it must be in or near a garden. A toothpick is a garden structure. It may be the first thing that you put in your garden when your small plant finally rises out the ground. This relatively small structure is what will guide your plant into becoming something huge and amazing. Going further up the ladder, there are structures that are the next logical step for supporting your plants. The plant once supported by just a tiny toothpick is now 100, 200, or even 1,000 times its original size and now requires more to flourish so you will have a successful garden. This stick is yet another garden structure. Things keep getting larger and larger in the gardening world, with plants now growing to staggering heights while 6-foot pieces of lumber support them. The supports for plants are just a tiny portion of the definition of a garden structure. There is also the decorative side of garden structures, and these objects are anything that adds a little beauty to your greenery. There are plastic or stone butterflies, structures that you attach or place on other structures such as picket fences surrounding your garden. The notion of garden structure is as vast as the imagination. Beyond the butterflies and picket fences, there are walkways set in the walking gaps of your garden. These paths serve no practical function except to bring a certain ambiance to your garden. Then there are fountains and stones in the middle of your garden that may serve no function except to enhance the overall beauty. The next step up in garden structures is to go up to gazebos and other large objects that are both beautiful and practical. You can even create buildings and inhabit these structures for a period of time. And, with all these definitions being thrown around while trying to pin down what a garden structure is, keep in mind that if you stand in a garden too long, you may become a garden structure too! Have you ever taken a walk through a well-made garden? These types of gardens are not only well tended, but there is also a noticeable structure. Small fences, fountains, or statues add to the ambiance and beauty of the garden and may help to guide people along or attract their focus to an area. These garden structures are useful additions that add to the attractiveness of a garden, but there is one rule about structures in a garden. The more natural a garden is, the better. This is why it is important to set your garden up for success and let the plants guide the person through the beautiful world of your bit of nature. The way to do this is to have a plan for your garden before it ever gets started. It’s important to sit down with a piece of paper and outline how you want your garden to be laid out before you actually get to planting. Too often, people just want to go get 10 or 15 plants they like or find attractive and get to work planting them. This is a lazy thing to do if you are a gardener. If you were building a house, would you just go out and buy lumber, nails, and a saw and start building away? Of course, you wouldn’t, so you shouldn’t do the same with a garden. Just like building a house, a solid foundation is the most important thing to get started. Figure out what kind of area and space you have to work with. You can leave room for expansion later, but for now, it is important to have solid boundaries. After that, it is important to plan which plants you want where in the garden and how you want them to work together to make your garden the best it can possibly be. You must set your garden up to become its own structure. If you need a wall to separate the walkway from the garden, you must first use an artificial structure like a picket fence, but it’s important to grow bushes that are firm and can be trimmed into walls later when they full grown. Also, many of the structures available are tools to define which way your plants grow. For example, a wire walkway is simple but provides a base for Ivy to attach to and makes an almost all natural walkway for people to pass through. Remember, nothing happens immediately. When you first set up your garden, it may look a bit cluttered, in spite of your best efforts to reduce that awkward look while small plants strive to take root. Once your plants start hitting their full growth, that unattractive stage ends and you can remove supporting structures to leave only nature. By the time plants have reached full maturity, you’ll have an absolutely beautiful looking garden. The most important decisions about your garden are made before you even purchase a plant. Let’s walk through some basic steps on site selection. Doing this now will save you much difficulty in the future. How much light does your proposed garden site receive during the day? This factor will determine what plants you can grow in that location. If you want to grow sun-loving plants, you need to check to be sure buildings or trees don’t shade the site during the day. Likewise, if you want to grow plants that prefer the shade, you need a site that doesn’t receive full afternoon sun. I urge you to spend a few days studying the light levels at various times during the day so you are sure you select the appropriate site for your garden based on the type of plants you wish to grow. There are two basic concerns about water. First, does any site in your yard get flooded during rainstorms? If so, don’t choose that site for a garden unless you want to use bog-loving plants. Taken into consideration where your hose hookup is and how far it is to your proposed garden spot. Do you want to drag a hose out once or twice a week to water it? If not, be sure to locate it closer to the hose hookups. Accessibility. Is the area around your proposed garden site relatively level? If not, do you want to invest the sweat equity necessary to make it suitable for a garden? Is anyone in your family in a wheelchair or otherwise mobility impaired? If so, be sure to leave 5 feet wide paths of patio blocks or bricks around the garden site. Utility Services. Once you select your proposed garden site, check with your local utility companies to be sure they don’t have underground pipes, sewers, or any other buried utility equipment that could be damaged in the process of gardening. Automatically rule out any proposed area that would interfere with utilities. In many areas, the local utility company will visit your property and identify the underground lines, etc. for you with orange flags. Do this before making final decisions on what areas you will landscape. Have you ever wondered if tending a garden was worth the effort? With all the work involved from preparing the soil to planting the seeds to cutting a handful of flowers or harvesting a few vegetables after waiting months, you’d think a garden should do more than simply look pretty or bear fruit for a little while. Even when your friends come over, the best you can do is show them your garden and talk about the work you’ve done for a few minutes. And then what? Nothing. But the situation doesn’t have to be that way. With a little bit of extra work, you could take your simple garden and turn it into something wondrous! The way to make a garden an interactive part of your life instead of just a party decoration is with a gazebo. A gazebo is a garden structure that is either put on the outer edges of a garden or, preferably, right in the middle. You may have to place your gazebo on the outside of your garden and grow new plants around the structure if you already have an established garden. You can place a table and chairs in the midst and enjoy the outdoors, no matter if it’s raining or not. You can sit and enjoy a steaming mug of coffee while the rain falls or have cool drinks when the weather is nice. And when your friends come over, they, too, can sit with you amidst nature and your plants for conversation and companionship. Before, they could only sit at your kitchen table near the stove. The gazebo offers the experience of not just walking out to your garden but taking part in it. Gazebos are not, as so many garden structures are, merely pretty. They are also rather practical. Since a gazebo is set away from the house and yet still feels to be part of the home, it opens up a wealth of options. If you, your spouse, or some of your guests smoke, a gazebo offers a lovely place safe from the elements that people can step away to for a cigarette, leaving your home odor and smoke-free. Also, since the gazebo is separate from the home and yet still part of it, the structure gives you a place to step away from time to time, as even those in the most wonderful relationships need a little space from each other. Locating and selecting a perfect landscaping plant is easy said than done. There are thousands of varieties of plants that you can choose from and each one of them has its own peculiarities and distinguishing feature. You may find yourself at the crossroads while selecting a suitable plant for landscaping your garden. It is very much sure that whether it is your front yard or backyard the landscaping plants will always add to its beauty. Here are some handy tips that will help you in easing out with selecting the most appropriate landscaping plant for your yard. The first point of caution is the climatic conditions and the plants that can grow in defined sets of these climatic conditions. You should always choose the landscaping plant that can easily survive and grow in the climate of your area of living. You may also approach a plant specialist or an expert horticulturist who will help you out in deciding in the better way. Let me expose a secret here for you. You will probably find the best landscaping plants from such a resource that you would have never imagined. Just dive into the huge varieties of landscaping plants. At this point, the purpose becomes extremely important. For an instant, if you are looking for some good landscaping plant for creating a gorgeous border of your yard then a sage plant could be an obvious and better choice. Sage plants generally fit into any home-domain of yards. Sage plants not only enhance the elegance of your garden but also are perfect plants to grow into your herb -garden as well. Herb plants serve you a dual purpose. These plants are better landscaping plants and at the same time, they have good practical and economic value. You can use them in your daily cooking as well. Time is another determining factor for compressing your choices for good landscaping plants. You plant choice should largely be based on the time of the year. If you are looking for a specific summer bloom then it is of no use to visit a garden store during winters. Therefore it is always wise to become seasonal while selecting, locating, and choosing a landscaping plant. Annual and perennial landscaping plants are aplenty and you may easily choose some varieties out of these stocks. You should purchase an annual plant every year afresh but perennial landscaping plants will grow back each year on their own. Tulip, for example, will get doubled every year if left alone. You can easily dig them up and replant elsewhere in your yard. Landscaping plants are lovely objects that would add up elegance to your garden in many ways. Garden landscaping tips and landscaping experts are aplenty online these days. You will have all these garden landscaping tips available for you with a little Google search on your computer. It becomes very important at this point to understand if all such garden landscaping tips universal in their nature and can each one they be applied in all the cases with similar results? Reality is quite different as a matter of fact. There is hardly any such garden landscaping tip that fits every domain. A particular tip that is suitable for one individual may or may not be fit for another at the same point in time. It is mainly because each garden landscaping project is different from other and requires a particular set of tips specifically. It is therefore much better to invest enough time in learning and selecting the fit garden landscaping tip before you actually start working on your garden landscaping project. The first thing you should ensure your learning is about including ideas that will keep your garden great and healthy throughout the year. It is slightly tricky in nature as the change in weather condition will make your task difficult and you need to be meticulous while planning for a great looking garden landscaping. You should invest a great deal of time and energy in learning about the plants and trees and about numerous other varieties that will keep the beauty of your garden landscaping intact irrespective of the winter or summer seasons. Try to visit your local garden store, nursery, or a botanical garden near to your area and if it is not very difficult do not hesitate in consulting a botanist, a horticulturist, and a landscaping designer who will help you lot in picking the best landscaping tips. Visiting a good library will also be quite fruitful as you will be able to find a lot much information therein. 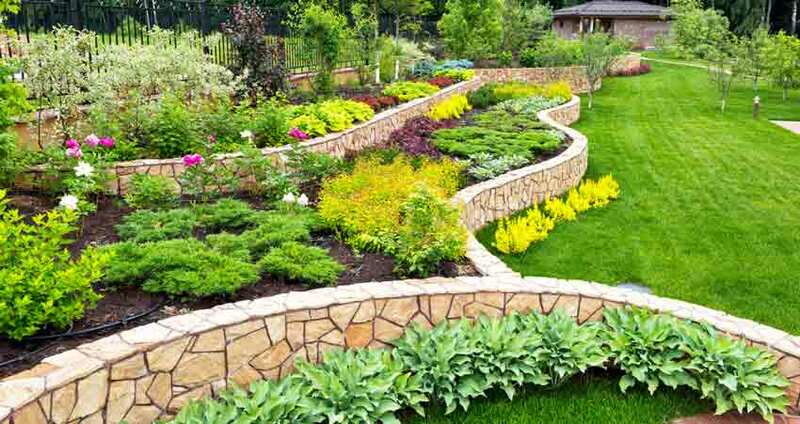 Layering all your planting beds in your garden will be a great landscaping tip. This will add a typical unity, balance, and harmony to the entire garden. Repeating these layers of planting beds will be another great tip and it will add elegance to your garden landscaping. There are no defined sets of garden landscaping tips and you should be prepared to learn and act in order to ensure the best results. In fact, the best tip is that fits best in the set up of your garden conditions. The first thing in garden making is the selection of a spot. Without a choice, it means simply doing the best one can with conditions. With space limited it resolves itself into no garden or a box garden. Surely a box garden is better than nothing at all. But we will now suppose that it is possible to really choose just the right site for the garden. What shall be chosen? The greatest determining factor is the sun. No one would have a north corner unless it was absolutely forced upon him; because, while north corners do for ferns, certain wildflowers, and begonias, they are of little use as spots for a general garden. If possible, choose the ideal spot a southern exposure. Here the sun lies warm all day long. When the garden has thus located the rows of vegetables and flowers should run north and south. Thus placed, the plants receive the sun’s rays all the morning on the eastern side, and all the afternoon on the western side. One ought not to have any lopsided plants with such an arrangement. Suppose the garden faces southeast. In this case, the western sun is out of the problem. In order to get the best distribution of sunlight run the rows northwest and southeast. The idea is to get the most sunlight as evenly distributed as possible for the longest period of time. From the lopsided growth of window plants, it is easy enough to see the effect on plants of poorly distributed light. So if you use a little diagram remembering that you wish the sun to shine part of the day on one side of the plants and part on the other, you can juggle out any situation. The southern exposure gives the ideal case because the sun gives halftime nearly to each side. A northern exposure may mean an almost entire cut-off from sunlight; while northeastern and southwestern places always get uneven distribution of sun’s rays, no matter how carefully this is planned. The garden, if possible, should be planned out on paper. The plan is a great help when the real planting time comes. It saves time and unnecessary buying of seed. New garden spots are likely to be found in two conditions: they are covered either with turf or with rubbish. In large garden areas, the ground is plowed and the sod turned under; but in small gardens remove the sod. How to take off the sod in the best manner is the next question. Stake and line of the garden spot. The line gives an accurate and straight course to follow. Cut the edges with the spade all along the line. If the area is a small one, say four feet by eighteen or twenty, this is an easy matter. Such a narrow strip may be marked off like a checkerboard, the sod cut through with the spade and easily removed. This could be done in two long strips cut lengthwise of the strip. When the turf is cut through, roll it right up like a roll of carpet. But suppose the garden plot is large. Then divide this up into strips a foot wide and take off the sodas before. What shall be done with the sod? Do not throw it away for it is full of richness, although not quite in available form. So pack the sod grass side down one square on another. Leave it to rot and to weather. When rotted it makes a fine fertilizer. Such a pile of rotting vegetable matter is called a compost pile. All through the summer add any old green vegetable matter to this. In the fall put the autumn leaves on. A fine lot of goodness is being fixed for another season. Even when the garden is large enough to plow, I would pick out the largest pieces of sod rather than have them turned under. Go over the plowed space, pick out the pieces of sod, shake them well and pack them up in a compost heap. Mere spading of the ground is not sufficient. The soil is still left in lumps. Always as one spade, one should break up the big lumps. But even so, the ground is in no shape for planting. The ground must be very fine indeed to plant in because seeds can get very close indeed to fine particles of soil. But the large lumps leave large spaces which no tiny root hair can penetrate. A seed is left stranded in a perfect waste when planted in chunks of soil. A baby surrounded by great pieces of beefsteak would starve. A seed among large lumps of soil is in a similar situation. The spade never can do this work of pulverizing soil. But the rake can. That’s the value of the rake. It is a great lump breaker, but will not do for large lumps. If the soil still has large lumps in it take the hoe. Many people handle the hoe awkwardly. The chief work of this implement is to rid the soil of weeds and stir up the top surface. It is used in summer to form that mulch of dust so valuable in retaining moisture in the soil. I often see people as if they were going to chop into atoms everything around. Hoeing should never be such vigorous exercise as that. Spading is vigorous, hard work, but not hoeing and raking. After lumps are broken use the rake to make the bed fine and smooth. Now the great piece of work is done. Many individuals have landscapes in their properties. Several of these landscapes are actually flower based, containing flower petals for decor, and also others are food derived, along with fruits and vegetables, expanded for consumption. Expanding a garden in your very own house is simple as well as the gardening pointers in this post, will certainly assist you to start. When you are working on your yard, you should consistently make certain to have a good product to kneel on. There are numerous items that are particularly designed for gardening, and also these are very important as they enable you to feel much more loosened up and also pleasant as well as protecting your knees. Using mulch is handy to crops that are located in severe warmth. The best compost to use is actually hardwood mulch given that this keeps in wetness and aids drown out the weeds. Timber mulch additionally adds nutrients to the dirt as this decomposes. Rock is actually made use of for compost also, nonetheless, the stone does not maintain wetness along with wood mulch. Organic or even agricultural-grade diatomaceous the planet is a gardener’s buddy. You could spread this over the dirt in your floral beds to always keep insects away. Slugs especially are actually reduced by the little, sharp grains. This causes them to swiftly dehydrate and will finish their life in your yard. Reapply after any sort of excellent rainfall hurricane. When creating your landscape, choose high-yield crops, such as tomatoes as well as natural herbs. These products will certainly allow you to make the best use of the area you possess readily available in your backyard. The, even more, produce you can increase at home, the additional funds you could spare in your grocery store bill each month, so it’s a good idea to recognize what will certainly generate the most for your initiatives. Crops should be safeguarded off winter. Throughout winter season time, the frost can present risks to vegetations, either by cold the water in their controls or develop sharp ice crystals which could sever or puncture crucial body organs. Tomatoes, especially, are very vulnerable to the freeze as well as needs to be actually relocated to a warmer indoor climate, or covered outdoors with frost-resistant fabric. When sprinkling this is very important to create sure that the water meets completely down of the soil. Origins that are grown closer to the surface are more likely in order to get harmed, as well as in turn produce crops that are actually much less sturdy and also even more at risk of damage. By putting water merely on the best coating, the origins are obliged to grow upwards and also turn into shallower. When raising hefty things in your backyard that is necessary to shield your back. You need to always elevate along with your knees when you are raising just about anything in the yard. If one thing is actually quite massive you ought to inquire a person to help you raise this to ensure you perform not result in harm to your spine or legs. As explained previously, many people have yards in their houses. Some landscapes are blossomy based and some are actually food items derived. You could quickly expand a landscape at your property making use of the recommendations from this post. Very soon you’ll have the capacity to odor clean blooms and also consume clean vegetables and fruits.